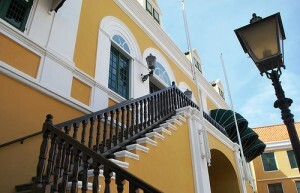 WILLEMSTAD – Eugene Rhuggenaath, as the one in charge of forming a new government, will visit the Governor today. The future Prime Minister will present his report on the formation of a new government. The judicial part of the screening which is under the Public Prosecution is already done. Rhuggenaath will inform the Governor about the entire screening process today but did not want to divulge much about the formation process. On May 11, Rhuggenaath was appointed as ‘formateur’ and was requested to form a government which has the support of the parties PAR, MAN and PIN. These parties form a majority in Parliament with twelve seats. On May 10 they signed a government agreement. Based on the Governor’s request, Rhuggenaath spoke with the candidate ministers and started the screening process as prescribed by the National Decree Integrity (Candidate) Ministers. This means that all the candidates must authorize four investigations: a judicial process which is conducted by the Public Prosecution, a national security investigation done by the Curaçao Intelligence Agency, a tax investigation by the Tax Inspectorate and a medical investigation done by ARBO Consult. Each candidate is also requested to turn in a financial declaration from each family member. According to credible sources the investigation into each candidate is almost done.